At SkyTruth, we work hard to make the unseen impacts of pollution and industrial development visible to the public. Our latest skytruthing effort is the FrackFinder. FrackFinder is a crowdsourced project to find, map, and track all sites where drilling for natural gas using hydraulic fracturing (fracking), occurs in the Marcellus Shale region of Pennsylvania. This project goes a step beyond plotting data from state and industry sources as “pins in a map,” because there is much more going on in the forests, fields, and public lands of the Marcellus Shale than a single point on a map can tell. There are many stages to the life of a well and drilling/fracking has a footprint far larger than just the individual well. 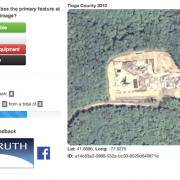 Our tool utilizes the innovative concept of crowdsourcing to enable concerned citizens to easily look at thousand of images over multiple years, allowing them to contribute to scientific evaluation of shale gas issues and provide us with large quantities of reliable spatial information. Crowdsourcing, outsourcing the work of image analysis to volunteers (like yourself), is an integral part of our vision of skytruthing — where anyone can see the impact of human activity on our planet, and take action to protect the environment. 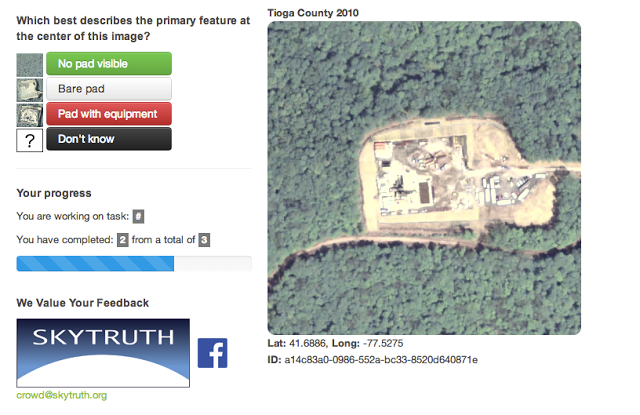 Example of a drilling site with equipment, as shown in the TADPOLE crowdsourcing tool. At this stage, we’ve gathered aerial survey photography taken by the National Agricultural Imagery Program (NAIP; the same high-resolution imagery used in Google Earth) in 2005, 2008, and 2010 and data extracted from drilling permits for fracking sites in the state of Pennsylvania. There are nearly 3,000 fracking sites across PA, and we are asking volunteers to classify the type of activity they see at these sites for each of the three years. That’s 9,000 separate image-analysis tasks. To ensure accuracy, we require each image to be viewed and classified by ten different volunteers. (Preliminary testing has provided us with impressive results; volunteers agree on what they see in an image 89% of the time.) This means there are 90,000 individual tasks — instances of an image being served up and classified — to be completed… Whew. Become a skytruther by participating in Project TADPOLE. First, please fill out our sign-up sheet so we can let you know how the project is progressing (we promise not to spam you). Then, go to Project TADPOLE and spend at least 20 minutes classifying drilling sites for us. And finally, we are still beta testing and we need your feedback so please tell us how your experience was on our Facebook page. We are continually improving Project TADPOLE and will be adding features such as a “finished” button to exit the tool. But please know that your work is saved as you go!